This photograph was taken about 1952/3 and shows the wolf cubs in the cubs/scout hall, St Andrews Road, Portslade. The building was an old green painted corrugated metal scout hut which has long gone and is now replaced with a medical centre. The photo shows the senior scouts at the back including the chief scout (5th from the left) and the Akela a very helpful lady who is fourth from the left. Thursday night was cub night and usually well attended! 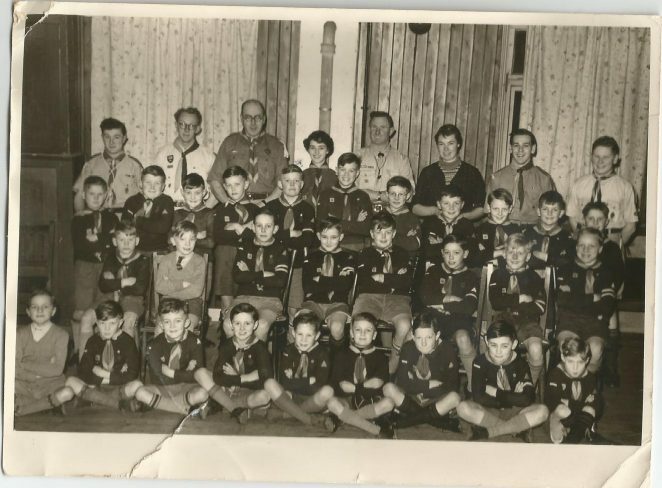 As for the cubs we have Peter Wickens in the back row second from left; myself, Ray Hack fifth from the left; and fourth from the right was Gerry Wickens. In the middle row seated, we have Roger Bennett fifth from the left, and I am sorry I cannot name all the others. In the spring time we had weekend camps at Small Dole at the back of the Downs and as far as I know the Scout Camp is still operating in Small Dole. I joined this cub pack (the 14th Hove pack?) a couple of years after this photo was taken. One or two of the adults seem familiar such as the vicar of St Andrew’s Church, Portslade at the time who was, I believe, Revd. Chisholm (third from the left in the back row) and Audrey Woolgar (on his right). Another adult was Fred? – possibly on the left of the vicar. Mrs Mower was in charge when I joined. One of the best parts about being a cub was the football team. We played on Portslade Rec. on Saturday afternoons on a small pitch tucked away in the north west corner. I can remember heading the ball one day after heavy rain. It nearly knocked me out – no plastic coated footballs in those days but they were good days!